After being swept in the Crossover Classic in Bellingham, Washington, the 0.500 UC San Diego women’s basketball team looked to get things back on track, especially after starting the year in such promising fashion. In the annual Thanksgiving Classic, home court was kind to the Tritons, as the team went 2–0 by virtue of two blowouts over No. 23 Saginaw Valley State University and Azusa Pacific University last Friday and Saturday. Despite the final margin of victory being a strong 82–69 in UCSD’s favor, the game was fairly close in the beginning. The Cardinals gave UCSD all it could handle in the opening quarter, matching each of the Tritons’ scores, causing the largest lead by any team all quarter to be a meager three points. But with the start of the second quarter, the Tritons found a new burst of energy. With 2:41 left in the quarter, senior forward Cassie MacLeod drained a shot from downtown to give the team a 12-point lead, the largest for the Tritons in the quarter. Unfortunately for the Tritons, the Cardinals also had a burst of energy waiting in the wings as the third quarter found Saginaw Valley State slowly chipping into the Tritons’ lead. With eight seconds left in the quarter, the Cardinals battled their way back into the game, cutting the deficit to just one point. The Tritons had none of this. After two more tied scores, a jumper by junior guard Paige Song put the Tritons up for good, as the team ran away with the game, crushing the Cardinals with a final score of 82–69. Junior guard Taylor Tanita starred with a game-leading 20 points and five assists, while MacLeod and junior guard Dalayna Sampton led the team in rebounds with 11 and 10 boards, respectively. The very next day the Tritons were at it again. In an afternoon matchup against Azusa Pacific, UCSD had a significantly easier time compared to the previous day’s matchup. Thanks to a flurry of three-pointers, the team found itself up 9–2 thanks to some three-point daggers from Song and Tanita. By the end of the opening quarter, the Tritons found themselves up 28–15 and on their way to an easy victory. One of the difference-makers wound up being rebounding. UCSD furiously outrebounded the Cougars by an incredible margin of 54–31, allowing the Tritons to control the pace of the game. A solid contribution from the bench didn’t hurt either: The Triton bench outscored Azusa Pacific’s by 14 points, allowing UCSD to have a balanced attack and preventing the Cougars from cutting into the deficit in any meaningful way. By the time the fourth quarter rolled around, the game was largely decided. The Cougar defense could not do anything to to cool the Triton offense that shot 41.7 percent from downtown for the entire game, as the Tritons matched all of Azusa Pacific’s 15 fourth-quarter points. The Tritons coasted to victory in an 81–60 trouncing. Redshirt freshman forward Mikayla Williams earned a double-double off the bench with a game-high 15 points and 11 rebounds, while MacLeod led the team in rebounds once again with 14 total boards in 23 minutes of play. 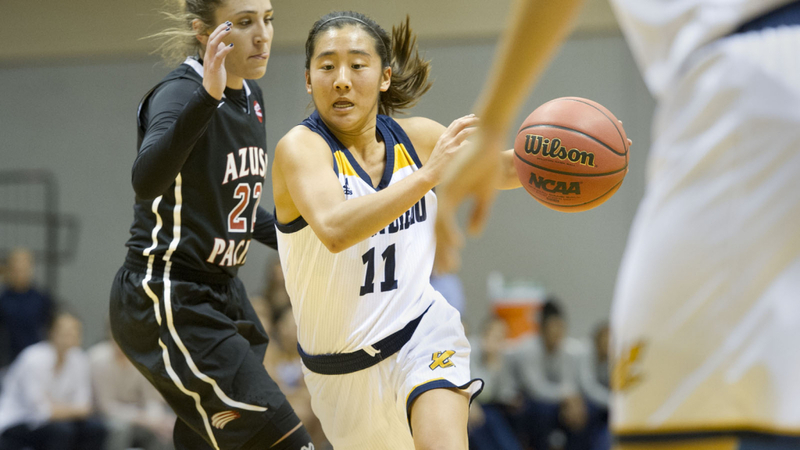 UCSD’s prowess was recognized at the tournament, as two Tritons were named to the five-person All-Tournament team: Tanita and senior guard Beth Mounier. Tanita also earned the MVP award. With the sweep, the Tritons improve to 4–2 overall and will head off to Cal Poly Pomona on Tuesday, Nov. 29.